Indulge in the warmth and beauty of solid wood. This storage option is ideal for linens and bath items of all sizes. Coverage for all linen cabinets lasts from 3 years from the original date of purchase. For more information please call 1-855-995-5578. Only made with the finest of care and attention to detail, this modular wall curio consists of a large soft-close reversible door cabinet with a clear, premium glass front with beveled edges, as well as three glass shelves within. It also includes a matching luxurious antique brass knob with a cut-glass insert, and a nylon seal in the back to avoid moisture buildup. It measures 12 in. across, 17 in. from back to front, and 48 in. from top to bottom. Comes in a sensuous, coffee finish. A timeless, exquisite wall curio comprising a soft-close reversible door cabinet with a clear, premium glass front with beveled edges, as well as three glass shelves therein. It also includes a matching luxurious antique brass knob with a cut-glass insert, and a nylon seal in the back to avoid moisture buildup. It measures 24 in. across, 17 in. from back to front, and 48 in. from top to bottom. Comes in a sensuous, coffee finish. This fully modular, sleek wall curio features a single, large soft-close reversible door cabinet with a clear, premium glass front with beveled edges, as well as three glass shelves within. It also includes a matching luxurious antique brass knob with a cut-glass insert, and a nylon seal in the back to avoid moisture buildup. It measures 24 in. across, 17 in. from back to front, and 48 in. from top to bottom. Comes in a sensuous, coffee finish. 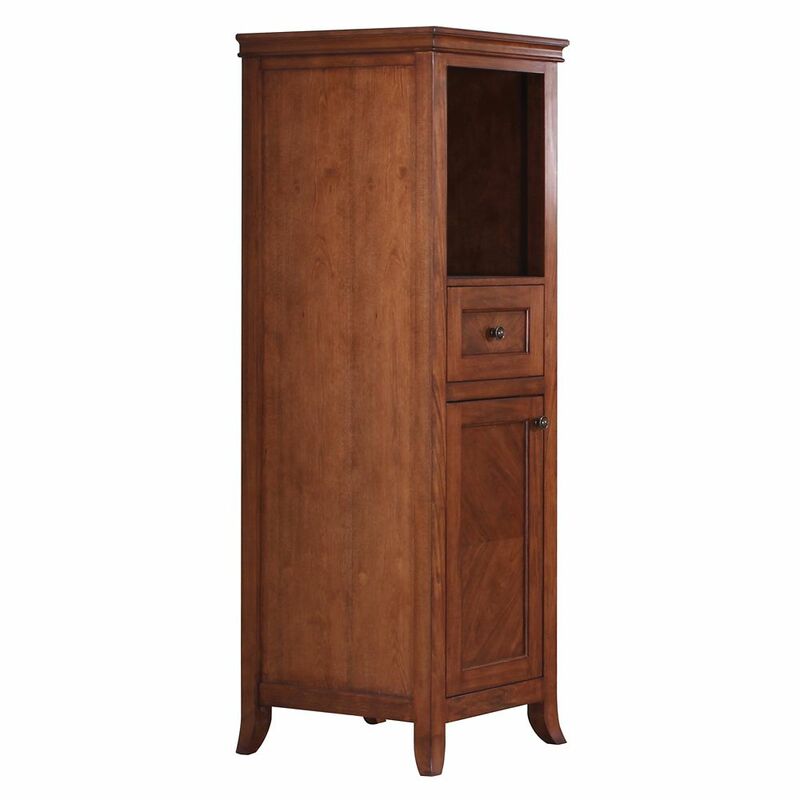 Ashwell 18-inch Wide Linen Cabinet Indulge in the warmth and beauty of solid wood. This storage option is ideal for linens and bath items of all sizes.